Where do I begin? Twenty-six years ago, when I last visited the Black Hills, Custer State Park was one place I’d hoped to go, but we did not get there, so it was on top of my list this time. Jim also had this on his top-four list of things to see and do. We were we not disappointed; we were amazed! Jim, Chewie, and I arrived fairly early. Since it is a South Dakota State Park, we couldn’t use our Annual National Park Pass. We paid $20 for the week pass for a car, but the annual pass was only $30. If there is any chance you may want more than a week here in a year, choose that option. With our pass, we also received information about the park and a map. Jim and I had already decided that we wanted to drive the Wildlife Loop and Needles Highway, so after a brief stop at the Visitor’s Center, we began our drive. I must say that stopping to watch the informational video shown at the Visitor’s Center is extremely helpful. Then, we went around a curve and down the hill. It was a dream come true: hundreds of bison (buffalo) were on each side of the road ahead. A few were actually on the road. We had stumbled into a herd crossing the highway! For 30 or so minutes, we stopped, eased up, stopped again, staring in awe at the scene before us. Bulls, cows, and calves were in almost every direction. Some were grazing, some were rolling on the ground, some were playing, and a few calves were nursing. In fact, as a part of our close encounter of the bison kind, a cow and her calf stopped immediately in front of our car for the calf to nurse. Just before that, a large bison, which had been grazing alongside the road, moved directly beside my side of the car and stayed there until it was time for us to move forward! The window was down, and had I dared, I could have touched the magnificent creature without fully extending my arm. Chewie, who rode in the back, was so good during this entire adventure. When the bison moved so close, he could not help but stretch his head toward my open window to sniff. I did worry briefly what the bison might do if Chewie barked, but Chewie never did the entire time we were in the park. When Jim asked him to sit back down, Chewie did. It was a spectacular experience! Here is the link to a Facebook Live Video. I watched this bull roll in the dirt. After we left the bison herd, Jim and I went in search of food and drink at the Blue Bell Lodge, and we were not disappointed. In fact, they allowed us to bring Chewie to the patio. When our drinks came out, the server even provided Chewie a bowl of water. We met another traveler there, and the three of us talked while we waited for our food. The gentleman was from Norway. An anesthesiologist, his job is to travel the world to bring citizens of Europe back home when they’ve had the misfortune of becoming ill while abroad in countries outside the EU. That is what I call getting paid to travel. Next on the agenda was to drive Needles Highway. The rock formations, the trees, the mountains themselves – all were beautiful. Jim had commented that he wondered why they had not use the Needles spires to depict the Presidents instead of carving on Mount Rushmore. We learned later in the week that had been one of the earlier considerations, but it was determined the spires were to weathered and fragile for such an endeavor. Near the end of this part of the road trip, we stopped to visit a lake. “If you’ve watched the second National Treasure movie, you’ve seen this lake. The lake you see in National Treasure: Book of Secrets is on the edge of Custer State Park; it’s Sylvan Lake, and it’s the highest lake in the Black Hills” (source). We wrapped up our long but inspiring day by swinging through the town of Custer for ice cream before driving past and admiring the work done so far on the ongoing project of carving Crazy Horse out of another of these granite peaks. For me, the opportunity to enjoy God’s beautiful creation and actually see all of the amazing wildlife, especially so up close and personal with the bison, is one of the highlights of my travel life. If you ever have a chance to visit Custer State Park, do yourself and your family a favor. Go! 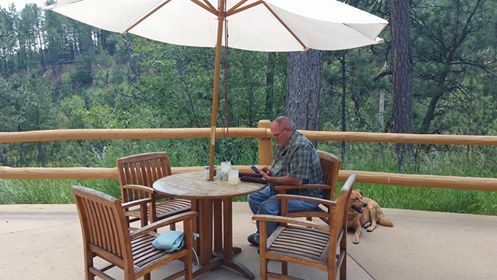 We are workamping in Custer State Park and enjoy the views daily.